SEO is becoming mainstream to the business owner. 6 to 7 years ago I would be shocked to find a business owner that new what SEO was. Today I am shocked to find one that doesn’t. The majority of business owners now know they need and want SEO. The problem now becomes understanding what SEO really is, and does a business owner ultimate get his website ranked in Google. Hence the BBB is trying to fill a need for its loyal members by providing a quick and easy guide to getting websites ranked. Reckless. Very reckless. If only SEO was as quick and easy as a 5 step. What BBB did here is shrewdly ask for a link. Asking for a reciprocal link to be more clear. Further, implicating that by adding a link to the BBB the businesses owner will get better ranks. They even linked to Moz.com within this misguided statement. Was this contrived or is the writer just naive? While this tactic of reciprocal linking isn’t entirely black hat, the fact that the article doesn’t give full disclosure that they are asking for a link makes me cringe. Despite the BBB’s attempt to gain links from their naive and trusting followers, the BBB did publish a survey with some good percentages for effective SEO strategies. 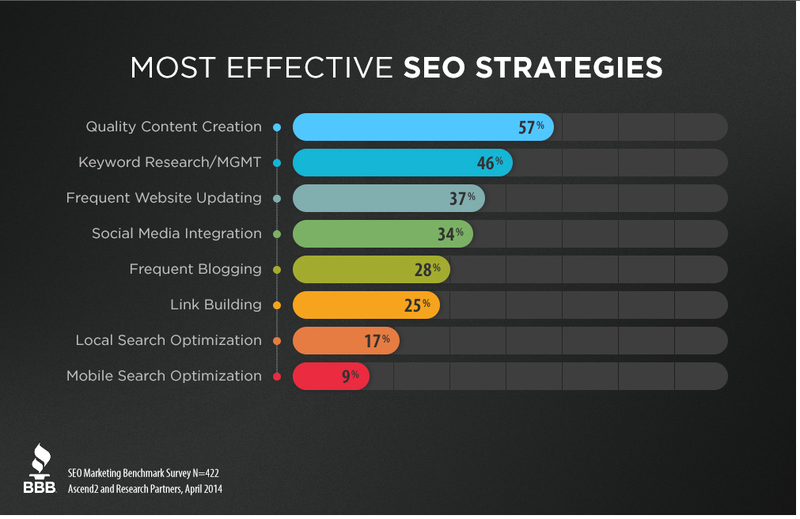 The survey put “Link Building” as the 3rd from the bottom. The respondents felt that “Quality Content Creation” is your best bet for SEO success. Bravo. Take the survey’s advice and work on your content strategy and keyword research. Give users the information they are searching for and your business should reap some SEM benefits. But please understand, SEO is not a quick 5 step project. It’s a competitive world out there, and everyone wants the first page of google. A fellow Bulwark employee and I recently attended AZIMA‘s August dinner event: How To Build Social Communities For Your Brand. The night’s speakers was Kevin Spidel, a self described “recovering political hack” who has extensive experience building and growing online communities in the political realm before doing so for more mainstream clientele. Online communities are not audiences. Like the minions, they need direction and support. “Communities are not audiences”. This is an important starting point to remember. Communities simply don’t happen. They don’t just appear all of a sudden and coincidentally happen to be comprised of people with strikingly similar preferences, passions or habits. Communities form for a reason. If you’re wondering where a given community is in the consumer funnel, forget it! You’re thinking of a different funnel. So don’t think like that. For that reason, communities do not need to be spoken to. They do not need marketing in the raw sense. They are beyond that point. What it needs is direction and purpose. “Once you have a brand ambassador, forget a digital strategy. 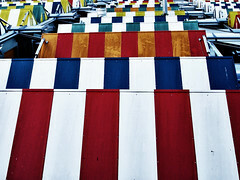 You need a volunteer strategy.” As vendors, or as markers, we easily get wrapped up in numbers. “What’s the ROI from last month?” “How was last month compared to like-month from last year?” “This customer just bought our product. How can up-sale him on additional products or services?” These are all statements that stem from the line of thinking that dwells on numbers and upper-right trending charts. It’s too easy to only view a consumer as a potential repeat consumer. Measureable performance is one thing, but when it comes to an organic community in an online setting, that is simply not the case. 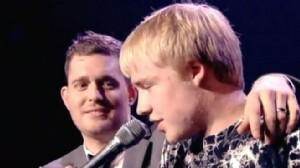 Singer Michael Buble let a fan accompany him on stage for an unstaged duet. Once you have a self-appointed brand ambassador on your hands, the possibilities are limitless. So, stop figuring out a way to keep selling stuff to that individual and come up with with a plan to empower them as vocalists. 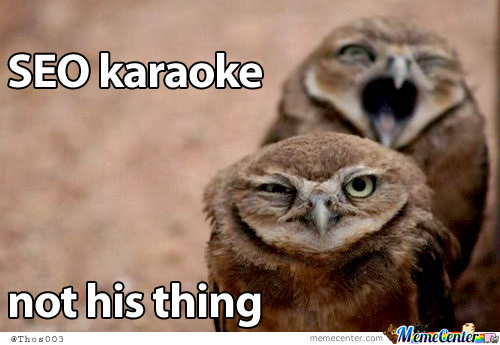 Provide a way for them to vocalize and share their experience or opinion. Build them a soapbox that they can stand on and say it in their own words. Better yet, let them borrow your soapbox. If you think about it, brand ambassadors will continuously and willingly purchase your brand, so don’t worry about that. Your strategy for those consumers should be to help them educate and proselytize within their circles – circles that you most likely don’t even know exist and to which you will certainly not have access. And, the gem of the night: “Loyalty is lack of a better option”. HALLELUJAH!!! We as marketers have a propensity to pat ourselves on the back at the thought of how loyal our customers have become. We often credit our elaborate campaigns and strategies as the reason our consumers like our product and service so much that they are unwilling to defect to a competitor, even at the temptation of a lower price or additional perks. Maybe, just maybe, it’s because they don’t have a better option. Or, said different, consumer’s don’t know they have other options. Every company thinks they provide the best products within their industry. Every pizza parlor thinks and advertises theirs is the best in town. Every bike manufacturer sells the “best bikes in the world”. On top of that, each one of those companies’ marketing campaigns suggest they have successfully conveyed that idea and that is the reason they have as many customers as they do. Now, let me tell you a different story. A friend of mine has been with his insurance agent for close to 15 years. All his insurance is through the same agent. Minus any catastrophic claims, they’ve been through thick and thin with each other. Their business relationship has even survived the possibility of changing to a competitor based on price….until recently. My friend was recently solicited regarding his policy and this unnamed competitor offered the same coverage, plus additional products at a noticeably lower price. Not just a few dollars, but a considerable sum. 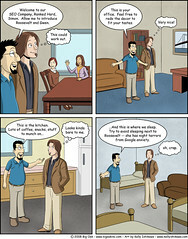 My friend even consulted with his long-time agent first, to see if he was able to compete with the new competitor. His agent still could not get within the same ballpark. Given that my friend was actively looking for ways to cut living costs, he has now agreed to terms with a brand new face and a brand new provider. Just like that! An Ohio native, Lebron James was destined to play for Cleveland his entire career. Until Miami came along with a better offer. Even loyalty has as price. At the end of the day, doing business with consumers or other businesses comes down to three things: price, results and tolerance. Are consumers comfortable paying the determined price to receive the expected return? Are the results in line with the consumer’s expectation, and within reason relative to the vendor’s price? Does the consumer harbor enough tolerance, mentally and financially, to accept the results (or lack thereof) relative to the price and expectation. When it’s said and done the consumer will ask themselves one thing: “Am I getting what I pay for?” Consumers will be loyal to those that get the job done. End. Of. Story. Building and nurturing communities within your brand has an intrinsic way of bypassing all of that. Healthy communities are comprised of believers, and even their faith in the brand will be tested. That’s normal. As you continue to educate and monitor your fold, the likelihood grows that their trust and belief in your brand will stand the test of time. Plain simple and sweet, here is my response. Ask for the close. Ask again. Ask again. So many people are ready to buy, but never get asked to close the deal. Be direct and ask. They may say “No”. Then you ask “why”. Solve their problem and ask again. Asking for a close doesn’t end the conversation… unless they say “Yes”. A Fairfax, VA woman was recently ordered to pay a fine of $750,000 after a judge ruled she not only left a fictitious review on Yelp, but that it also cost the contractor she hired north of $300,000 in lost business. In the summer of 2011, Jane Perez hired Christopher Dietz to perform construction on her home. Sounds simple enough, right? Wrong! According to Perez’s user reviews on Yelp and Angie’s List, Dietz actually damaged her home rather than repaired it. She also claims he billed her for work that he did not perform at all. Oh yeah, she also accused him of stealing jewelry because he was “the only one with a key”. And somewhere in between all that, she accused him of trespassing. And, (yes, there’s more) to top it all off, they are old high school classmates. It’s nice to see that at least one of them graduated. Classmates aside, the judge’s ruling poses an interesting precedent in the online review world going forward. Will more businesses try to defend themselves against what they feel are false reviews? Do they only have a legitimate defense if they can prove there are a significant amount of lost wages? What is considered admissible evidence for both parties? And what really happened in history class between Perez and Dietz? Hind sight is always 20-20, but you have to hand it to Dietz for sticking up for himself and seeking damages. Would Dietz have sought retribution had there been no financial loss? Probably not. When it comes down to dollars, especially 300,000 of them, people will usually get serious about protecting it. It seems like the most realistic and easiest way to get rid of a negative review would be to ask the customers who actually like, and would recommend you, to write more positive reviews in order to bury the others. At the very least a business owner should feel obligated to respond to any unfavorable post in a timely and professional manner. While that customer may have a legitimate argument, it bodes well for a business when it faces the music and appropriate, and publicly, addresses any concerns. If you’re a business, and going to compete in the big-kid world, you can’t be childish when a grumpy customer decides to throw a tantrum. Even a non-response can be viewed as more disingenuous than responding unprofessionally. It is against rules to pay or offer incentives to customers to write positive reviews online. That certainly makes sense. If a customer is going to write a review it should be because they want to share their experience with your company, for better or worse. But I say business owners should be making their customers aware of their online profiles, even encouraging them to leave a review at their discretion. But DO deal with angry Yelpers. That’s good business. Encrypted_Search_Terms, How am I being found for this? 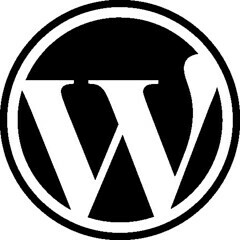 If you check out the search terms that are being used to find your WordPress blog you may come across this phrase “encrypted_search_terms”. Why? Has your site been hacked? 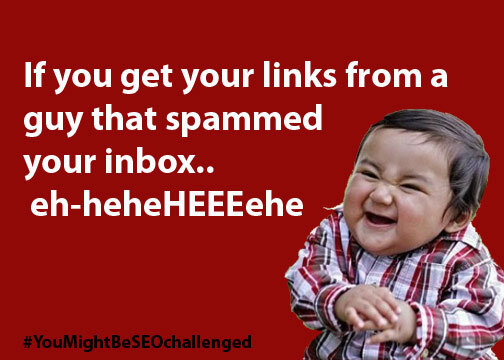 Or are you a sneaky SEO that has been hiding something and you’ve been caught by Google. If you are worried about this term showing up in your wordpress dashboard read on. Encrypted_Search_Terms is now my all time biggest traffic term! It is nice to know what people are finding your site for, so I keep track using wordpresses traffic tools. “Christmas Lights Ditto” has been one of my best search terms ever, but it and others were just passed by “encrypted_search_terms”. But it’s not that I rank for “encrypted_search_terms”, it’s because the search terms the googler searched are actually being encrypted. If you use Google Analytics you will find these terms labeled, “Not Provided”. Per Google it is only going to effect about 10% of your traffic. That was the stat they gave when they first launched this encryption, “to protect the user.” But there are many that report this impact is far greater than 10% and that it is only expected to grow. Should I be worried about “encrypted_search_terms” showing up on my dashboard? The term showing up does not indicate anything about your site. You are most likely not being found for that term. This term is now showing up for everyone using WordPress’s site tracking. If you care about knowing how you are being found, then yes you should be a little more than worried about this. Google is taking away search data. If you have been trying to watch your search terms trends then this will be a problem. Your data from year to year will now be flawed, especially if the percentages continue to change. Can I get this data back? No. Sorry, but there is no real solution for you to get the data back. You can run analysis on which pages are being seen most frequently and make inferences as to what terms brought them to those pages. You can pay for pay-per-clicks to find terms that may become hidden. You can ask users to share the data. But there will be no going back to the days that Google shared openly with the webmaster this information. 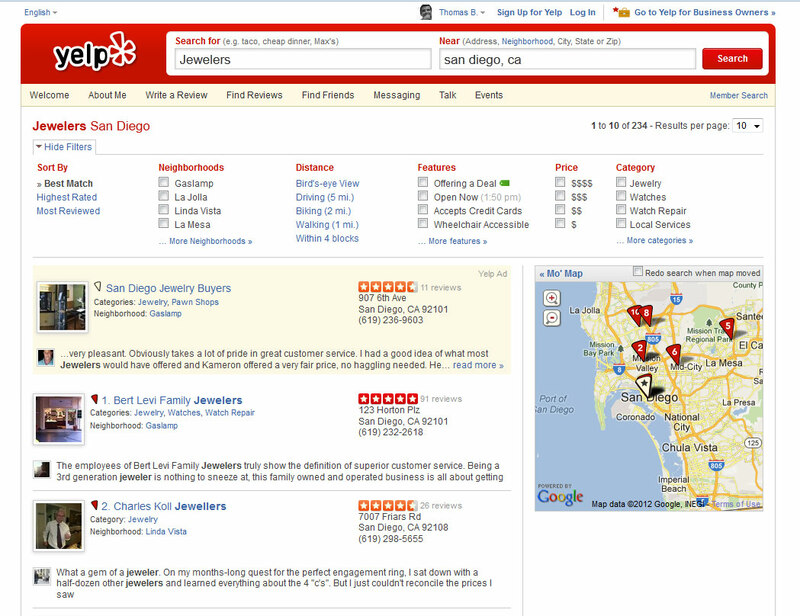 Does this Yelp Penalty Affect Ranking? The mobile version does not currently show the consumer alert whatsoever. 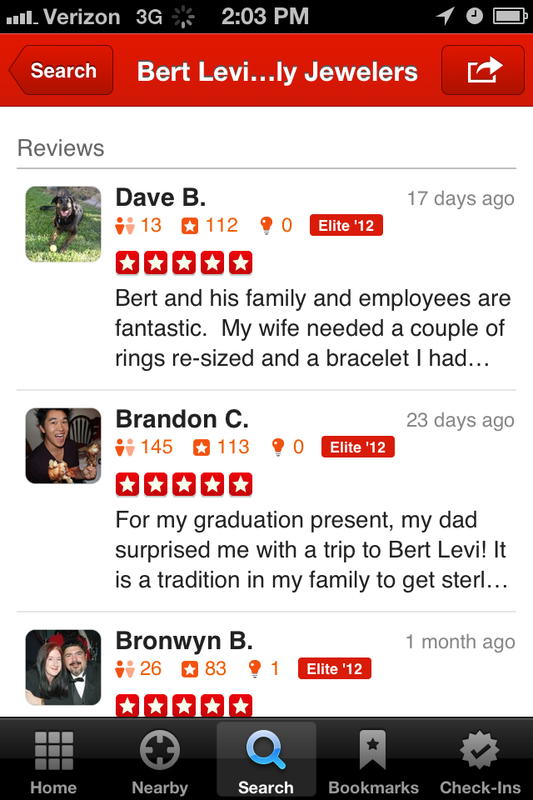 And the yelp deal with Levi, one that pays yelp, is still active. Honestly, I think yelp could show some more teeth here. But for the sake of making a public example of this company, I believe they are opting to keep them up. 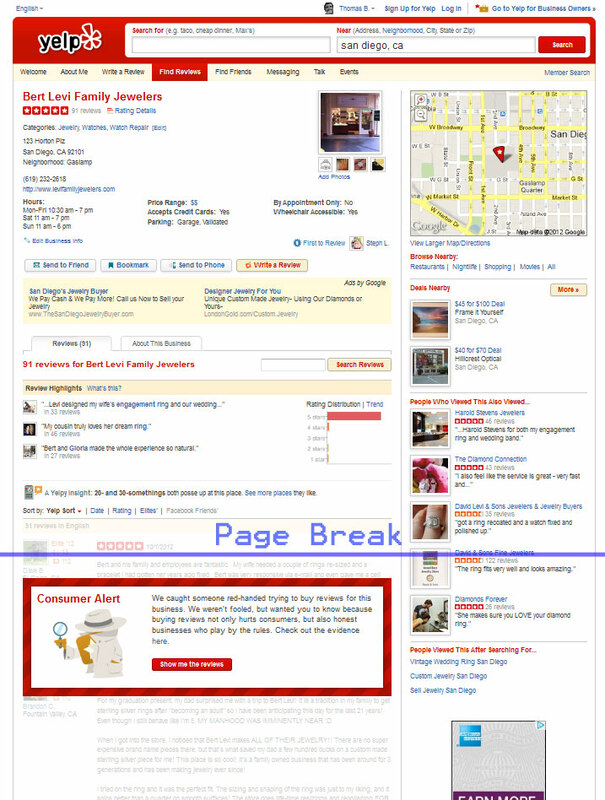 This is also a recent update and I am sure that the future versions of Yelp penalties will be modified. The email correspondence occurred beginning Oct. 11th through Oct. 13th. It appears that it was leaked to the press very quickly and thus the public relations team is getting their message out. However, from a previous yelp broken filter blunder in which Yelp quickly reacted to remove the reviews, I feel yelp still fails to make a solid stance. Their previous blunder only called for a quick cover up, it did not remove the members who violated the guidelines. 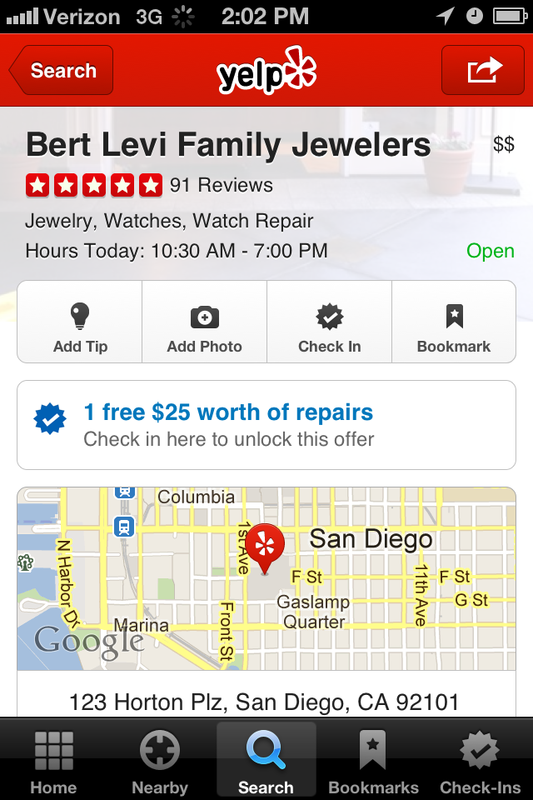 Will yelp protect the other members that the Jeweler paid off to get good reviews? 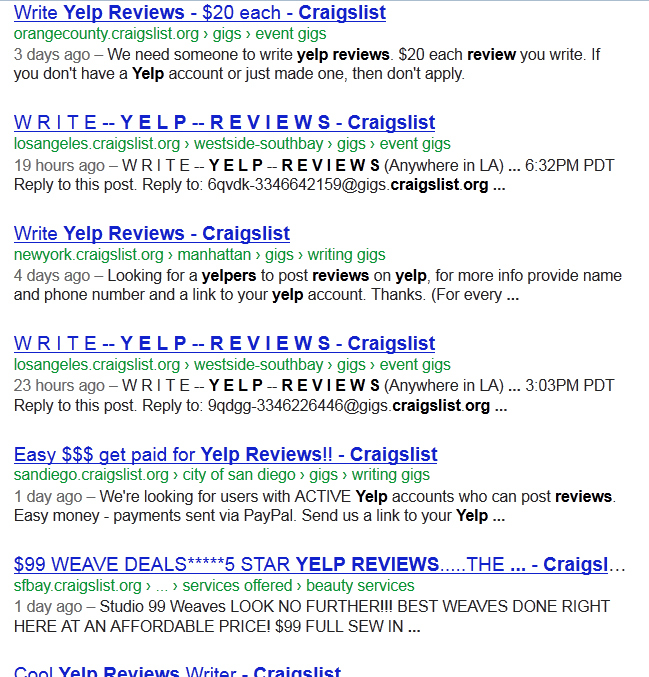 Will there be a point when businesses get an advocate to combat yelpers gone wild? Rumor has it that there is a pest control guy that was caught red handed buying reviews on yelp as well. I have not been able to find this bugger. I am shocked however that a Phoenix pest control competitor of mine openly offers a credit for a yelp review on his website. 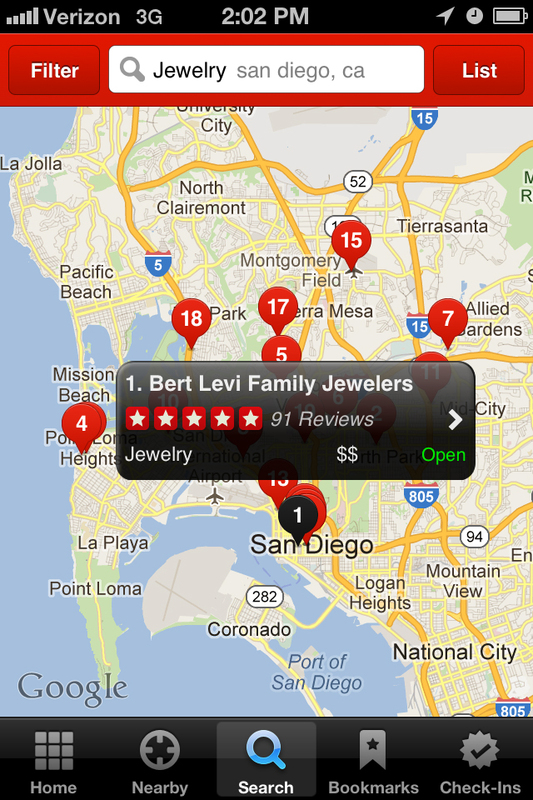 It seems that this should certainly be a red flag for yelp. Apparently a yelp review is only worth $5 for pest control companies. That is a bit shy of the $200 the jeweler is offering and the $100 a restaurant in Sedona is offering. Home & Garden Shows for Marketing Pest Control? Intrigued, I searched this article out online. …It was no where to be found. Beyond the fact that I could not find this quote anywhere online, I see some flaws here. The quote is 5 years old. A ton has changed in 5 years. 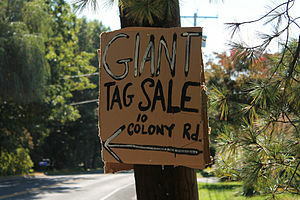 Internet marketing is still in it’s infancy. Frankly, I find it hard to believe that internet marketing can be beat on ROI. But that’s only speaking from my experience as a pest control guy. As it were, the fully report cannot be located online, therefore I cannot even determine if internet marketing was considered in the study. The quote alone a reveals nothing as to the business or businesses that they used to determine that Home Shows were the best ROI for marketing dollars. Sorry, but this quote does nothing for me. I need real data please. Where would you put your money for the best marketing ROI? Well… that really depends on who YOU are. If you expect to get the exact same results as everyone else in a specific marketing avenue regardless of your business, of you location, or of your target audience then you don’t understand marketing. “Consumer Shows” probably work extremely well for the wedding industry. It’s a very niche audience, the attendees are looking to buy your service. But for the vast audience of “Homeowners”, not all of them will need new flooring, new windows, or new appliances. And many of them will not show up at a Home Show with the sole intention of finding a pest control company. Therefore, it becomes a harder sale. An exterminator’s ROI is not going to be the same. And the San Antonio Home and Garden show isn’t cheap, well not by my standards. How many pest control services would one have to perform to recoup the money and time investment? Don’t buy into the “Branding” concept. Don’t just assume that you have to brand your business and that the ROI can not be determined for every marketing endeavor. The best way to determine ROI is with hard numbers. Find a measuring stick and use it. And work it backwards. How many widgets do I have to sell to break even on a given marketing campaign? Does that number seem feasible with the size and demographics of the audience? When it comes to numbers, my accountant has taught me to error on the side of caution. Be realistic. Look at the worst case scenario. Once you determine how you will measure the success and considered the value at the worst case scenario, then you can proceed and report on the success or failure. but hey… i am just a pest control guy.